There are few places in South Africa as richly steeped in the past as the site of the present Theological Seminary, for this is where our colony was born. On this very spot, then still a little island in the Eerste River with the main riverbed on the side where the village now lies, Simon van der Stel had his tents and pavilion pitched for the first time on 7 November 1679. It was here, too that he gave the new settlement the name of Stellenbosch. The first Drostdij in Stellenbosch was built on the island in 1687 by master carpenter Adriaen van Brakel and his team of five German builders, two brick-makers and fourteen slaves. And it is on the foundations and basement of this original Drostdij that the seminary still rests. The Island in the Eerste River disappeared in the 1770th, when the northern branch of the river filled up. Fires, Flood and a Hurricane damaged and nearly destroyed the building, and it was repaired and rebuilt several times. 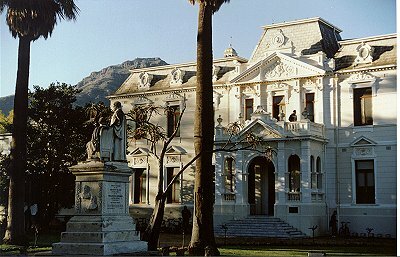 The landrost had his residence here, the building was used as court house and finally the Theological Seminary was inaugurated in the old Drostdij in 1859 - and higher education began in Stellenbosch. 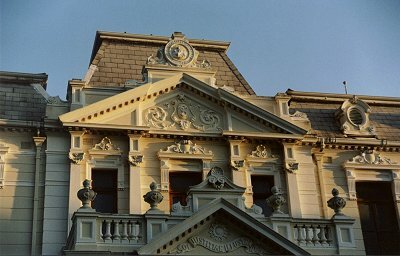 The building was remodelled in 1920 to its present form.